HMCS Vancouver recently became the first modernized Canadian frigate to successfully test surface-to-surface missiles against shore-based targets. This is the first time in the history of the RCN that the Navy has used a surface-to-surface missile launch capability in this way, using the Harpoon Block II missiles. The firing of the missiles in a Coastal Target Suppression mode is the first time the Harpoon Block II missiles and the new Combat Management Systems aboard the RCN frigates have been used together for this purpose. “This was a great Navy morning, as the hard work of the past several years culminated in the delivery of a new capability in support of the broader CAF mission. The successful execution of JoLTEX 16 resulted from the coming together of RCN, Special Forces, the Materiel Group, and our evaluation teams to achieve several firsts for the CAF, including the delivery of combat effect by the RCN in a joint littoral environment. As the Test Director, I offer my appreciation to all involved, but specifically to the crew of HMCS Vancouver, who was ‘all in’ in terms of making this happen,” said Navy Capt. Darren Garnier, Commander Canadian Forces Maritime Warfare Centre. 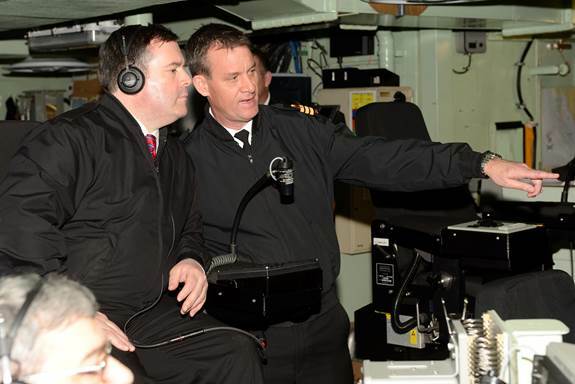 The successful test of the surface-to-surface missiles was made possible due to the years of innovative work that has gone into modernizing RCN ships and weapons systems. The Halifax-class frigates are currently undergoing a modernization and life extension program, valued at $4.3 billion. All 12 of Canada’s frigates are expected to be back in service by 2018. The exercises were conducted as part of a Joint Littoral Training Exercise (JoLTEX.). JoLTEX 16 was conducted at a U.S. Navy missile firing range and was held from March 30 to April 1.